Recently I was talking with a friend who is in the last month of her second pregnancy. She has had nausea all throughout her pregnancy, and has not been able to get enough calcium in her diet due to not being able to take calcium tablets or eat dairy foods. Because of this, she is having constant pain in her bones. During pregnancy, your need for calcium increases. You need it and the baby needs it, and if you don’t get enough in your diet, your baby will draw what it needs straight from your bones, causing considerable pain for you. If you are able to eat things like cheese, yoghurt, tofu, and milk, those are a good way to get some calcium, but you do need the supplements as well. If your nausea is only in the morning, then take your tablets later in the day when you are feeling better, always taking them with food. If you have nausea throughout the day, it will be harder to take tablets and keep them down, but try. Maybe you could add the tablets to a milkshake made with some fruit, yoghurt or milk, and lots of ice. But what can you do if you aren’t able to eat dairy foods or take calcium tablets? A quarter cup of sesame seeds has 351 mg calcium. A cup of boiled spinach has 245 mg.
A cup of boiled collard greens has 266 mg.
One tablespoon has about 137 mg.
One cup of raw kelp has 136 mg.
Two tablespoons of raw tahini (sesame seed butter) have 126 mg.
Two cups of boiled broccoli have 124 mg.
One cup of boiled chard has 102 mg.
One cup of boiled kale has 94 mg.
Two ounces of Brazil nuts (12 nuts) have 90 mg.
Two cups of raw celery have 81 mg.
One ounce of almonds (23 nuts) has 75 mg.
One medium papaya has 73 mg.
Two tablespoons of flax seeds have 52 mg.
One medium orange has 52 mg. 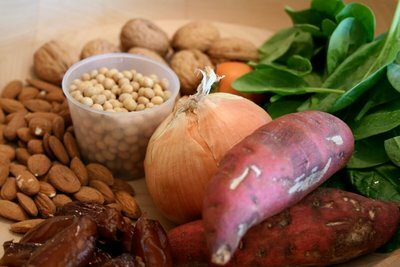 Here is another link for dairy-free calcium sources. They also list receipe ideas. It won’t be easy if you are one who experiences all-day nausea your whole pregnancy long. I’d recommend looking at these lists and seeing what appeals to you and trying it. These foods are also good for those who are alergic to dairy products, or those whos kids don’t like milk. And even if they do like milk, adding some of these foods to their diet (and yours too) on a regular basis will increase not only your calcium consumption, but your overall health. What are your favorite non-dairy calcium foods? Do you have recommendations for pregnant mothers who are having a hard time getting enough calcium? What worked for you?